February is LGBT History Month, a month to promote equality and diversity for the benefit of the public. Increasing the visibility of lesbian, gay, bisexual and transgender (“LGBT”) people, their history, lives and their experiences and this year's theme focuses on Peace, Activism and Reconciliation. We have a great collection of books to support LGBT 2019 on Libby, our free eBook service, featuring not one but two LGBT Westerns! Close Range by Annie Proulx and Sebastian Barry's Days Without End. We also have a varied selection of LGBT books in our libraries including the brilliant The Miseducation of Cameron Post which was adapted to film last year and tells the story of American teenager Cameron, who is forced into a gay conversion camp after her religious family discover her sexuality, in an attempt to 'cure' her. Crime and cookery entertained East Sussex residents in 2018, with authors Peter James, Lee Child, John Grisham and books on healthy eating hitting the top spots of the most borrowed adult books for the year. Children, on the other hand, gravitated towards more classic works, with Roald Dahl being the most borrowed children's author of 2018. If There's No Tomorrow by Armentrout, Jennifer L.
To find out what our staff are reading during the year, visit our monthly feature Get In Our Good Books on the Your East Sussex website. Our team of librarians are hoping to inspire you with their top picks of adult fiction, non fiction, audio, children's and their own personal choice. Have you, like many of us, started the new year with a resolution to be healthier and happier in 2019 then One You East Sussex, the county’s healthy lifestyle team, could help you reach your goal. They are running health check sessions across the county with free 45 minute appointments available in the libraries below. The Health Check includes Blood Pressure, Heart Rate, BMI and Cholesterol Diabetes Assessment and Healthy Eating /Lifestyle advice based on results. The 45 minute appointments are available between 11-3pm. Book yours today! Eligibility criteria: you need to be aged 40-74, without pre-existing heart/kidney conditions or diabetes and NOT on blood pressure /cholesterol medications. Sessions at Hampden Park and Hollington libraries are also coming soon. This month we are taking part in Safer Internet Day with this year's theme as 'Together for a better Internet'. Elizabeth from Friends Against Scams will be visiting Eastbourne library on the 6th February from 10am to 1pm to answer all your questions and promote resources to keep you safe from scams. On the 13th February 10.30-11.30am Hastings library will host a Natwest scam busting session aimed at adults wishing to learn more about avoiding harmful scams online. There will be a presentation including some quick tips by Claire from Natwest as well as the chance to ask any questions. Claire will then visit Rye library on the 27th February from 1.30-2.30pm. This sessions are free to attend and there is no need to book. For parents who are concerned about their children's safety online, the Safer Internet Day website offers a host of information and advice from conversation starters to online family activities to involve everyone. We are committed at all times to keeping you safe on our library computers. We wipe all your data after sessions. As well as helping the computers run smoother by reducing what’s stored on them, it means nobody else can access your documents or files – even if they stole your library card and PIN. It can be difficult to know where to go for information. Our computer screens have links to reputable sites, including the Council, NHS and Government websites to help you get started. If you have questions, ask a member of staff. We have strong filters and firewalls to protect younger users from inappropriate content, and to protect everyone from cyber-attacks and scams. Help yourself – use strong passwords, be aware of your surroundings, don’t leave screens unattended. If using your own devices make sure your antivirus and firewall is up to date and avoid entering sensitive information in public places. IT for You training at Hastings and Lewes Libraries – additional spaces available now! Our dedicated team of volunteers are ready and waiting to teach you new digital skills. To learn more about email, the internet, eBooks, social media or Microsoft Office, call 01323 463759 to book your place. 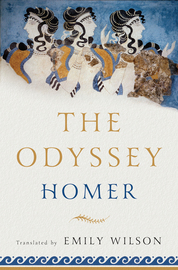 This month our book is the Greek classic 'The Odyssey' translated by Emily Wilson and reviewed by our Head of Customer and Library Services, Stephen. The Odyssey will always remind me of the languid summer of 2018. I spent many happy hours in the shade on those hot weekend afternoons reading this wonderful new translation by Emily Wilsonn of Homer’s epic tale of gods and monsters, the first ever translation of this work by a woman. The Odyssey is the best and worst travelogue you ever read. Ten years after the fall of Troy, Odysseus is imprisoned on an island by the beautiful nymph Calypso, who is in love with him. The sea voyage that finds Odysseus washed up on Calypso’s island has involved a battle with the Cyclops, who eats members of Odysseus’ crew, a close encounter with the Sirens and their deadly song, a fight with the sea monster Scylla (more eating of crew members) and a near-miss involving his ship and the giant whirlpool Charybdis. It’s a health and safety nightmare. Odysseus has no means of escape, but Calypso is persuaded by the gods to release Odysseus. She lets him build a raft and return home to Ithaca, where suitors are seeking to marry his wife and murder his son, thereby inheriting his kingdom. Though supported by the goddess Athena, his onward journey home is not plain sailing either. He’s shipwrecked along the way and finally reaches home twenty years after he originally left, to be reunited with his wife and son, defeat the suitors and reclaim his kingdom. I approached the Odyssey, for the first time since we were read some of these tales in school, with some trepidation; after all, this 9,000 year old Greek poem of more than 12,000 lines is not one of our quick picks! However, Emily Wilson's translation is a real joy; a fast-paced, modern and highly readable re-telling of this story of return, with its themes of cunning and temptation, identity and legacy, but ultimately home, family and loyalty. I had to ration myself to it in the end, so I could make it last as long as that seemingly never-ending summer. Looking for more reading inspiration? Each month one of our librarians reviews five of their top picks on the Your East Sussex website: read our latest recommendations. Missed these amazing movies at the flicks? 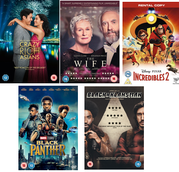 These award winners and nominees are available to rent on DVD from East Sussex Libraries.